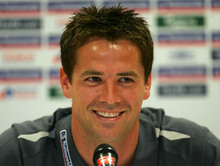 Konami has announced it has secured the services of Michael Owen, who will now appear on the packaging of Pro Evolution Soccer 2008 (I am, although as an Xbox owner I was very, very disappointed with the latest Pro Evo; hopefully the new one will be a lot better). Owen joins winger Cristiano Ronaldo, who will also appear on the cover. I know Kipp! I’ve played it on PS2 at a mate’s house and it’s brilliant. Xbox version was cack though. I own both the PS2 and Xbox360 versions, the 360 one left out a ton of stuff, it was a growing pains/get this out the door release. Reading about the next version got me all excited again, it’s going to put back all the features they left out. However xbox live play is still pretty fun. I think the PS2 version was pretty flawed aswell. I have gotten through three controllers after smashing them up in sheer frustration. The scripting of the games and the crap through balls just fucked me off so much it was unreal. I bought the xbox360 one as soon as it came out, 2 days later i traded it in for another game, it was horrible and a huge dissapointment, i hope this one is waaaaaaaaaaay better! we should make a petition to remove the scripting! I will stand along side you till the end Kipp! I did the same as Chringle…..I traded the 360 version in the day after i bought it and picked up the ps2 version….It was miles better. The 360 version was so badly coded it was unreal, and the constant frame rate slow down was a piss take…..
lol, i pity those who play pes6 on the xbox. no L2 or R2 buttons muahaha. its way sweeter on the ps2. can’t wait for the newest konami release!